An Education in Engagement Rings — South Hills Jewelers | Since 1982. When You Want Jewelry That Makes a Statement. The marquise cut? The solitaire setting? Not sure of the difference or even how to begin? Choosing an engagement ring is one of the biggest decisions you will make on the road to your wedding day. We educate you on everything you need to know to buy the perfect diamond for your bride-to-be. All four Cs have been established by the Gemological Institute of America (GIA) as the universally-accepted standard for assessing a diamond’s quality. Get educated about the GIA’s 4Cs, so that you can select your engagement ring with the utmost assurance. A polished diamond’s beauty lies in its complex relationship with light. The magnificent display you see is made up of three attributes: Brightness is the combination of all white light reflecting from the surface and interior of a diamond. Fire describes the “flares” of color emitted from a diamond. Scintillation describes the pattern of light and dark areas and the sparkle you see when the diamond, the light, or the observer moves. A diamond’s proportions affect its light performance, which in turn affects its beauty and overall appeal. Diamonds with fine proportions, symmetry, and polish optimize their interaction with light, and have increased brightness, fire and scintillation. GIA assesses these factors for standard round brilliant diamonds in the D-to-Z color range. Although many people think of gem quality diamonds as colorless, truly colorless diamonds are actually very rare. Most diamonds used in jewelry are nearly colorless with tints of yellow or brown. Color grades are determined by comparing each diamond to a master set. Each letter grade represents a range of color and is a measure of how noticeable a color is. Fluorescence: Some diamonds can emit a visible light when exposed to ultraviolet radiation, but fluorescence is not a factor in determining color or clarity grades. However, a description of its strength and color is provided by GIA reporting as an additional identifying characteristic. The GIA clarity scale includes eleven clarity grades ranging from Flawless to 13. Because diamonds form under tremendous heat and pressure, it is extremely rare to find a diamond that lacks any internal and external characteristics. These characteristics are a by-product of its formation and help gemologists separate natural diamonds from synthetics and simulants, as well as identify individual stones. 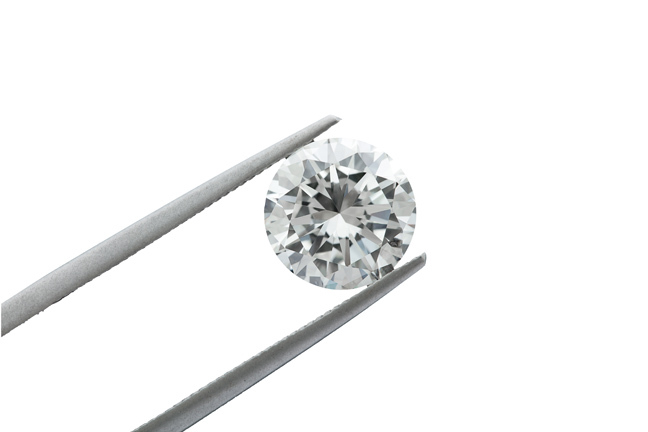 For diamonds under one carat, each carat is divided into 100 points, similar to pennies in a dollar. For example, ½ carat is equivalent to 50 points, whereas 0.75 carats equal 75 points. Want to learn more about the 4 C's? Click here.